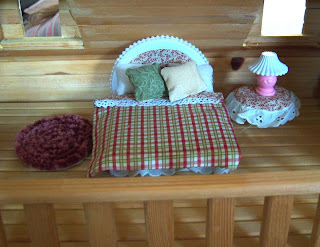 My daughter has been playing Little House on the Prairie in her log cabin dollhouse this week. (It may have something to do with us reading that book together right now!) Anyway, she needed another bed for "Laura and Mary to sleep in......" so Mommy got the job. 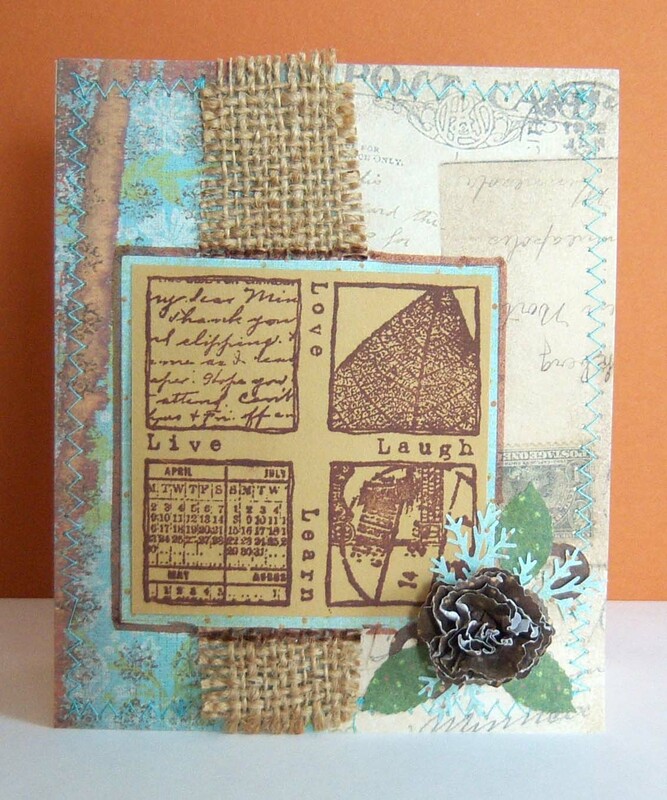 I decided to make it "earth tones" this time -- maybe fit in that log cabin she's playing with a little better! 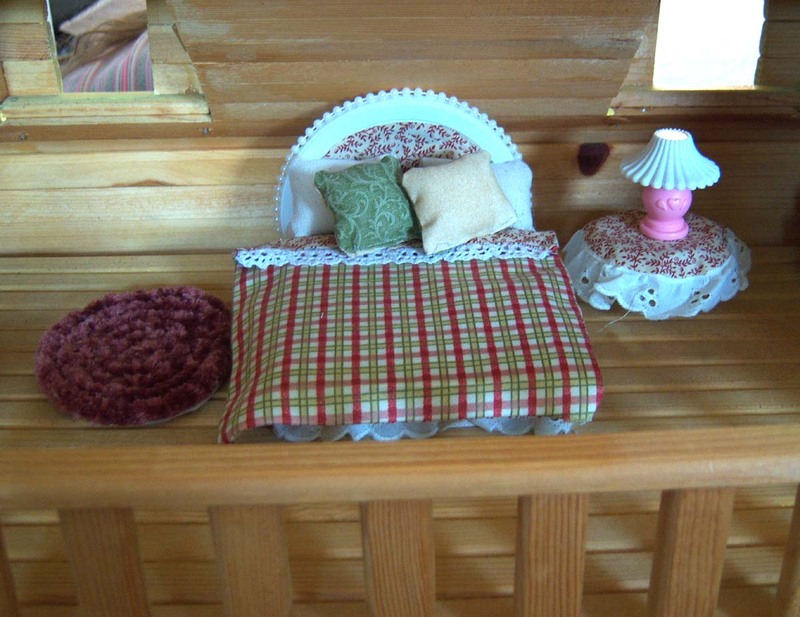 I also made it smaller than the first bed (this post) since it's for the little girls to sleep in. 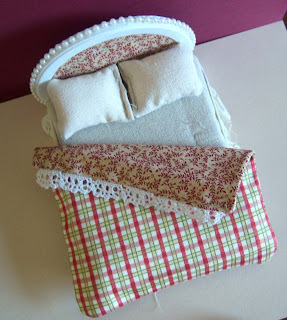 Here you can see I made the sheet of muslin this time instead of the white handkerchief. 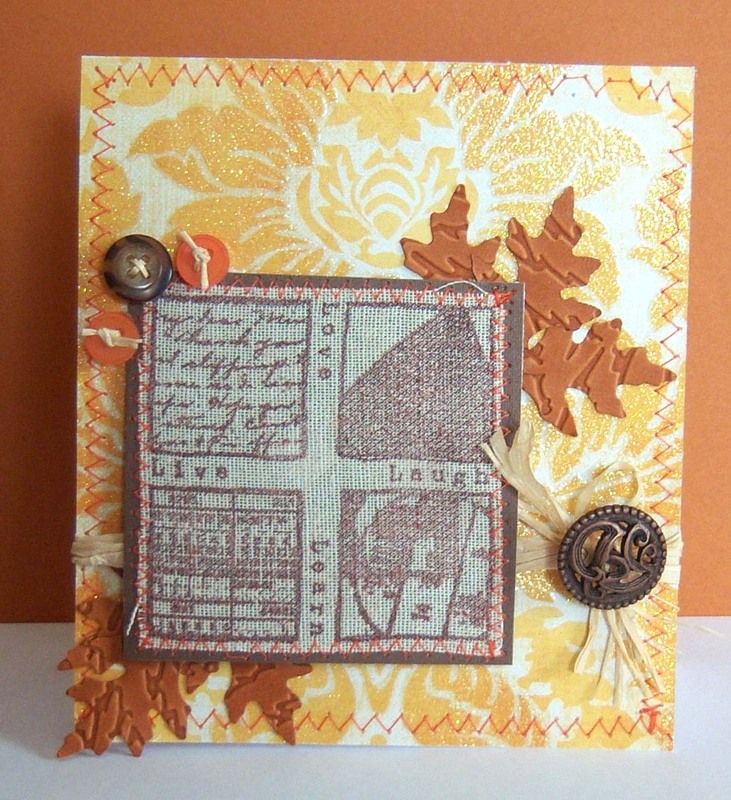 It went with the earth tones better. Also, made two pillows for sleeping instead of the one last time. 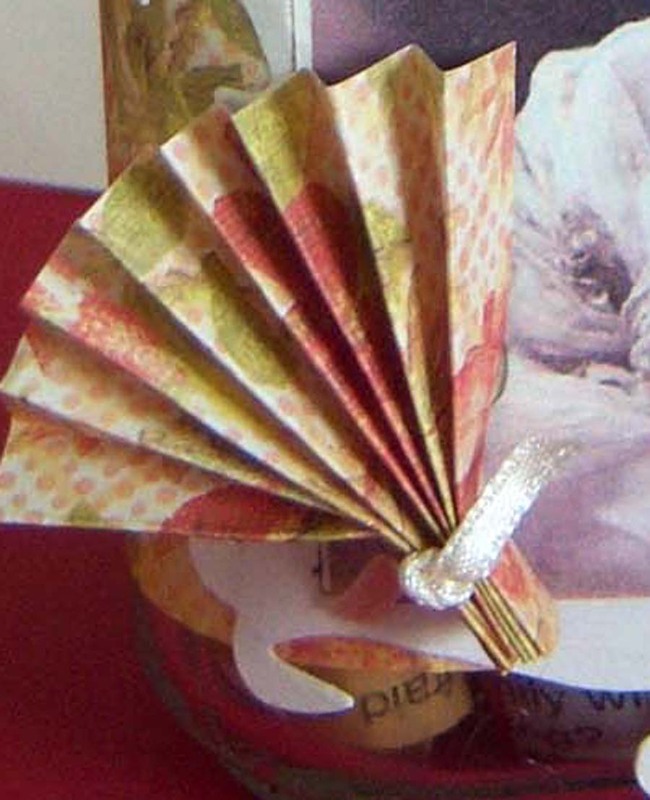 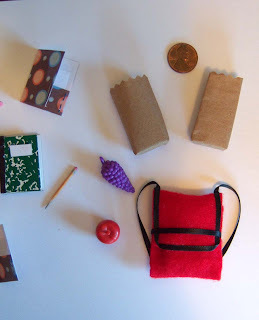 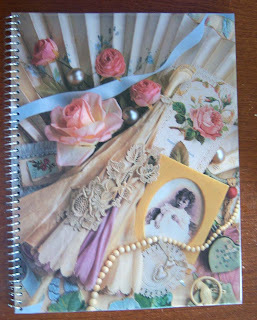 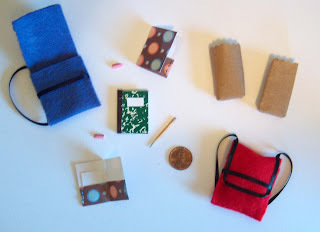 Got the idea for this from a book called Tiny Treasures (American Girl) -- but I didn't exactly follow their directions -- just sort of used it as a guide. 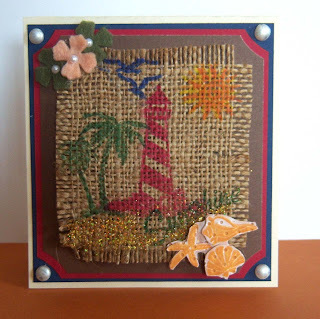 The rug was made by braiding yard and then hot gluing it to a piece of felt. 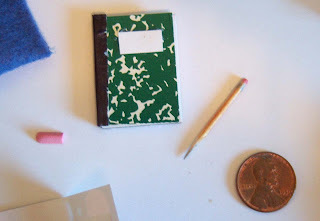 The nightstand (not in the book -- just something I made up) used a round piece of cardboard glued to the top of an empty wooden spool. 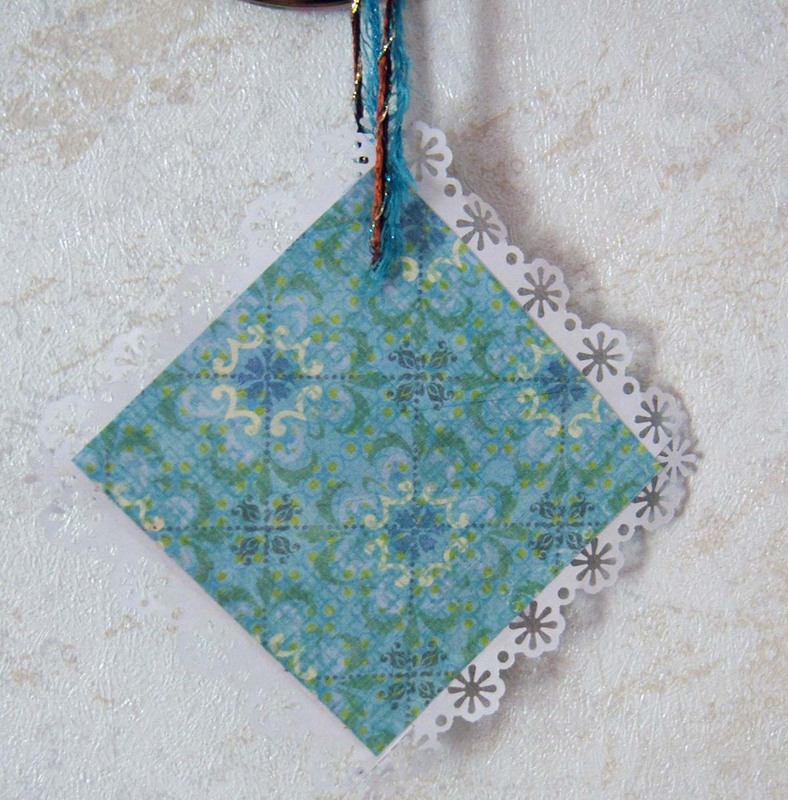 Then I cut a circle of fabric and glued the lace around the edge. 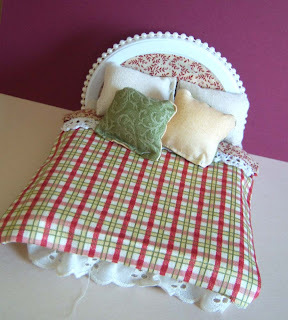 I glued the tablecloth to the piece of cardboard and wa-la - a nightstand! 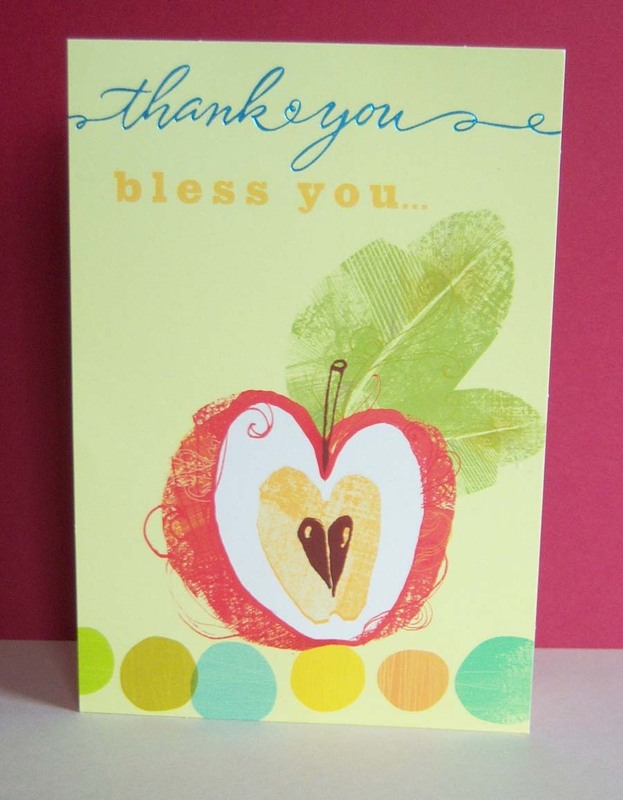 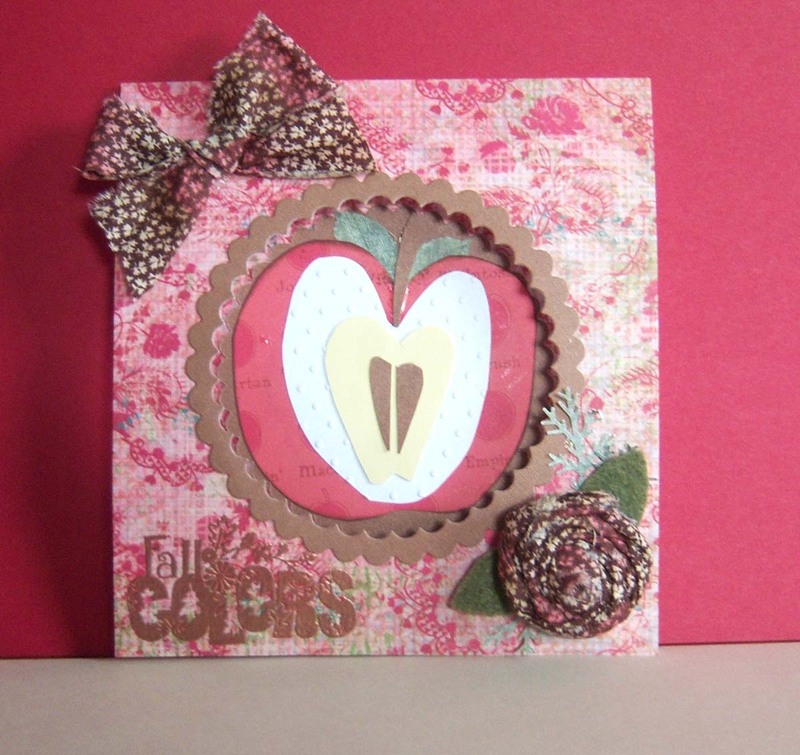 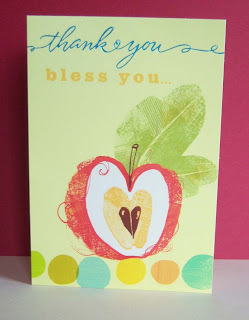 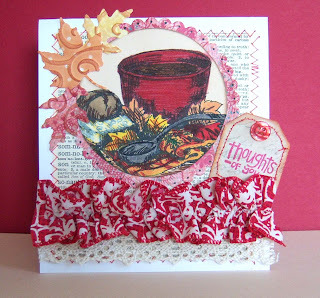 Received a thank you card the other day that became the inspiration for this harvest apple card. 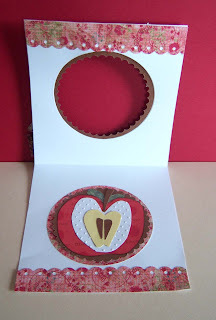 I noticed the apple shapes were somewhat heart shaped and decided to try a paper piecing of my own. 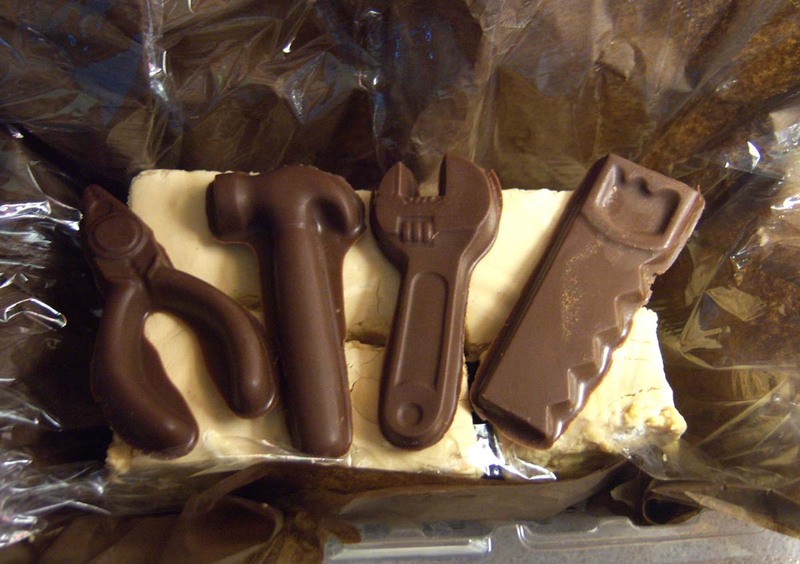 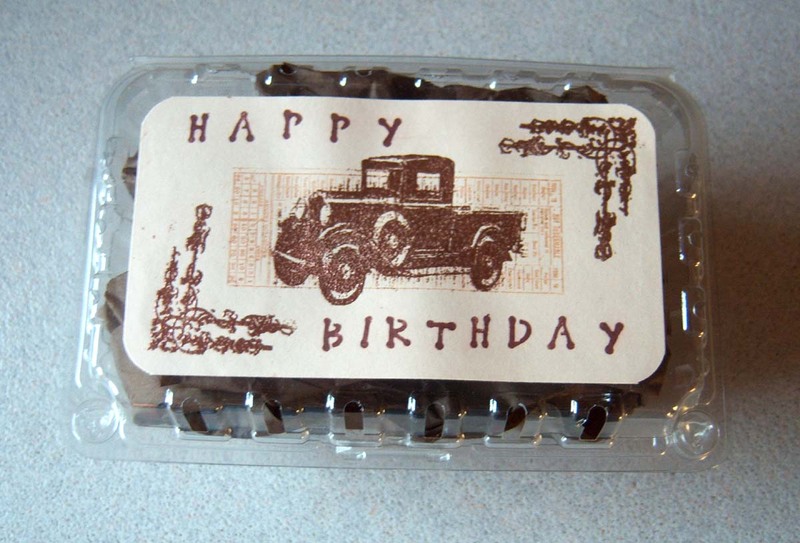 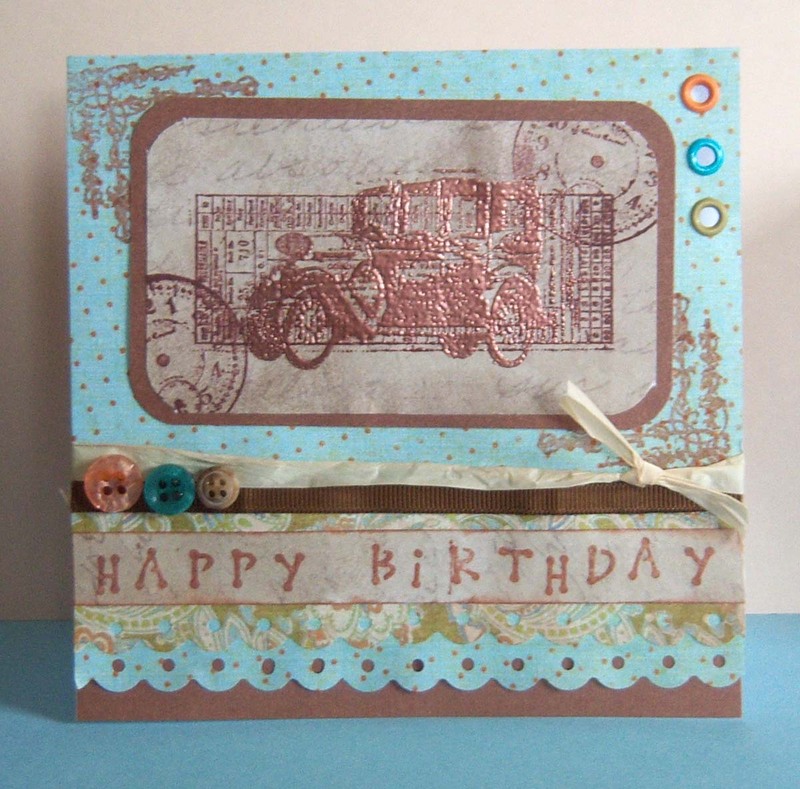 Here's a masculine birthday card I created recently. 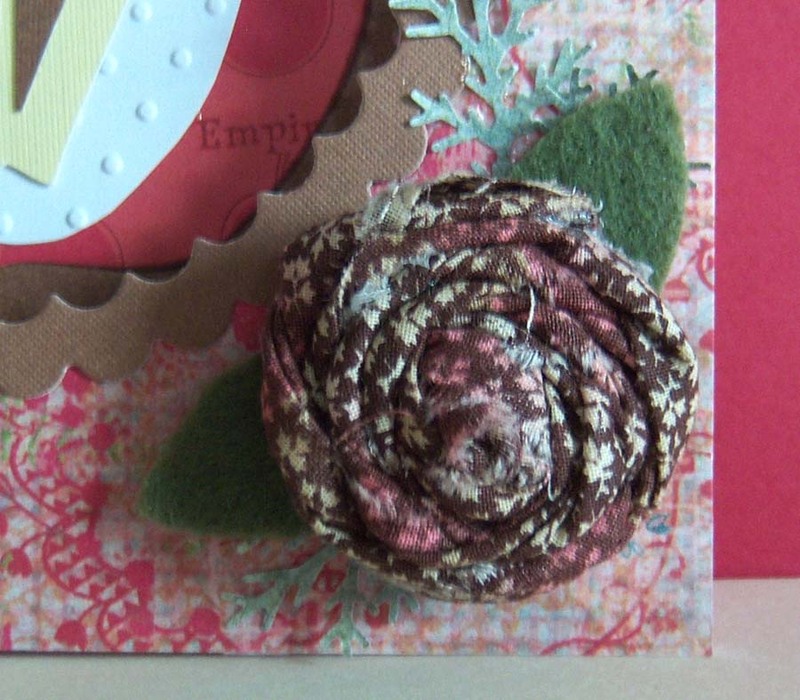 Hope the buttons and raffia don't make it look too "girly." 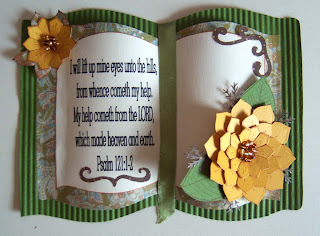 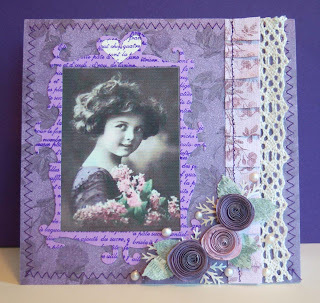 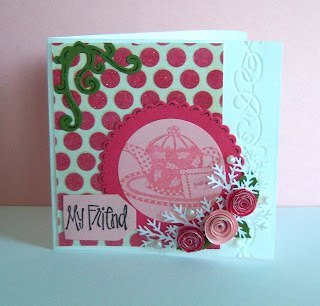 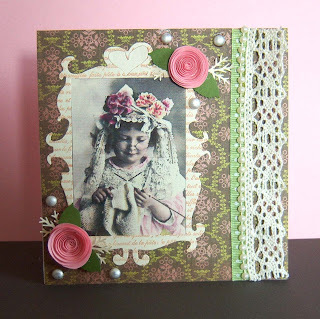 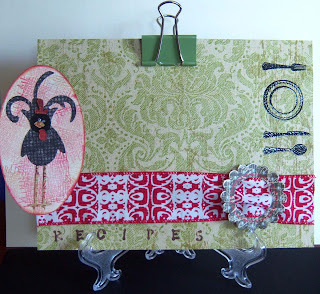 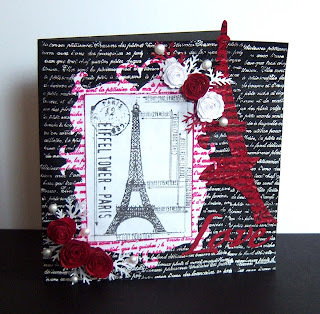 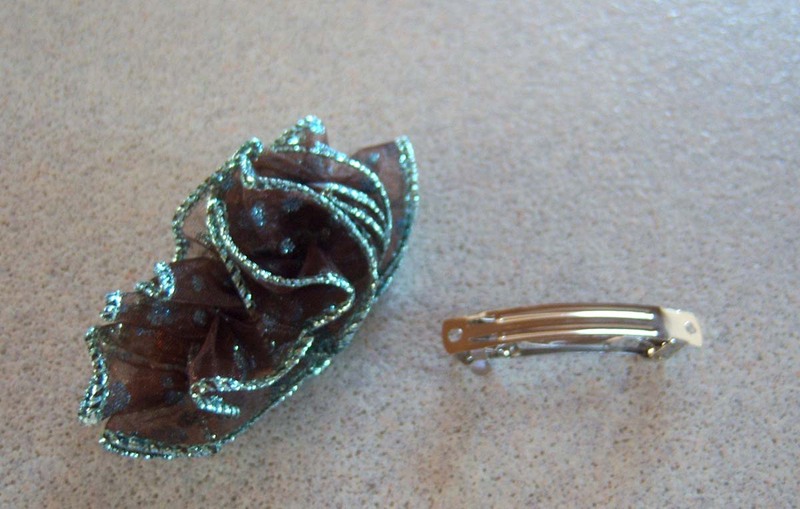 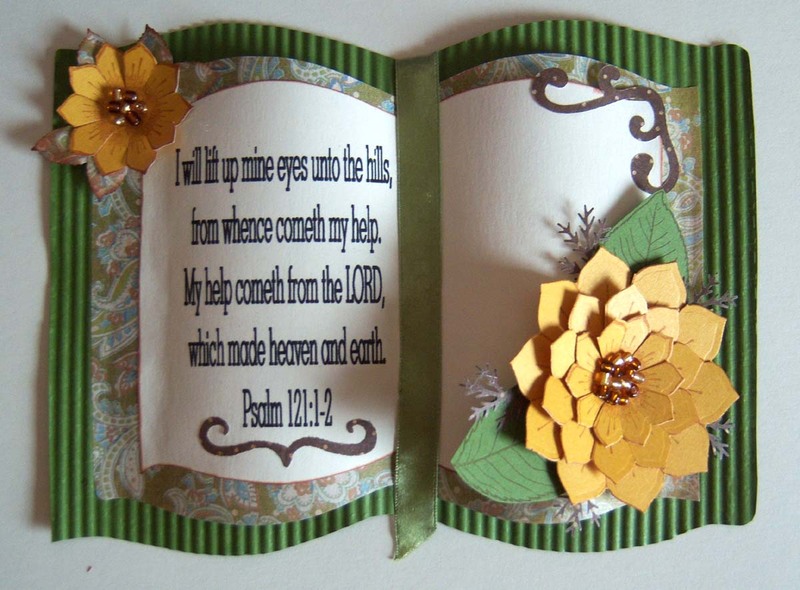 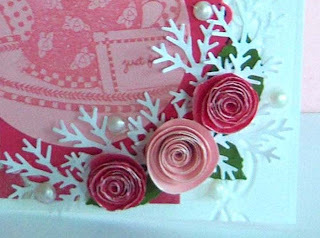 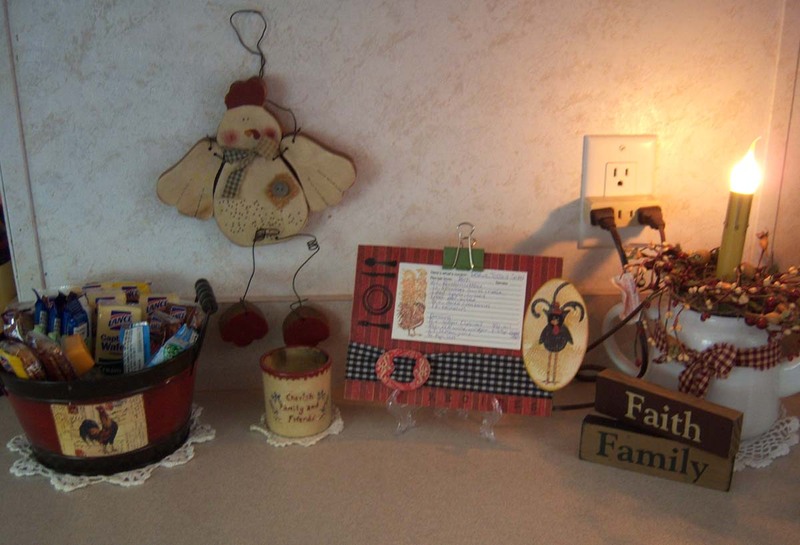 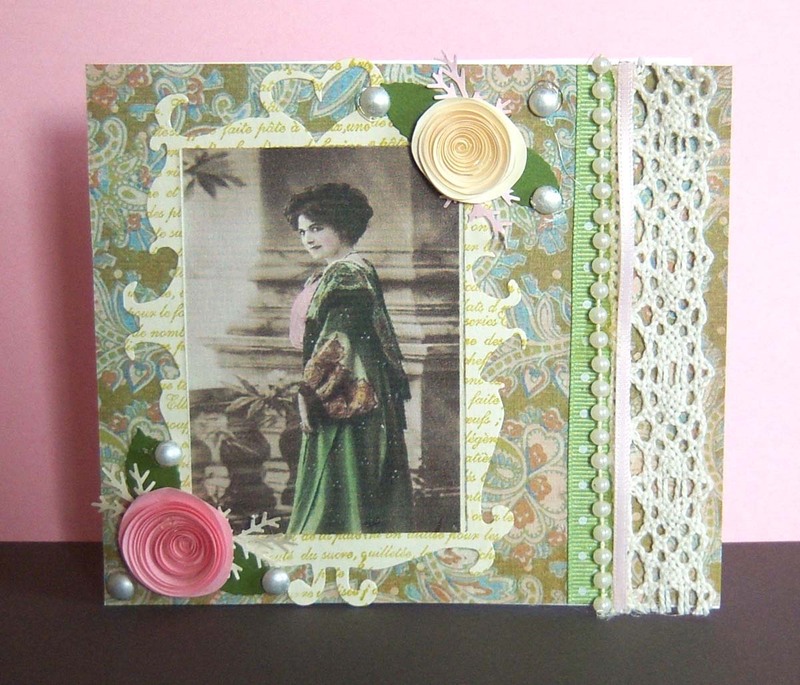 It's difficult finding embellishments to use on masculine cards! 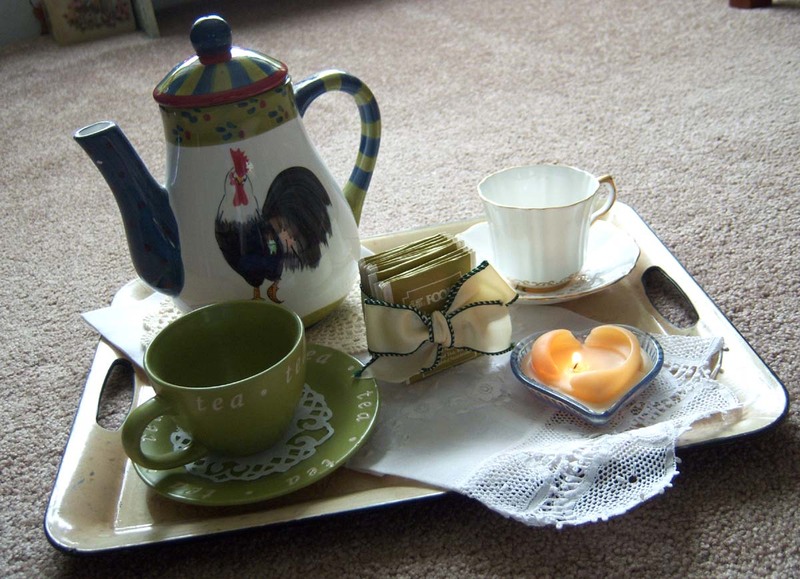 I have this "Tea For Two" tray sitting on my kitchen counter. 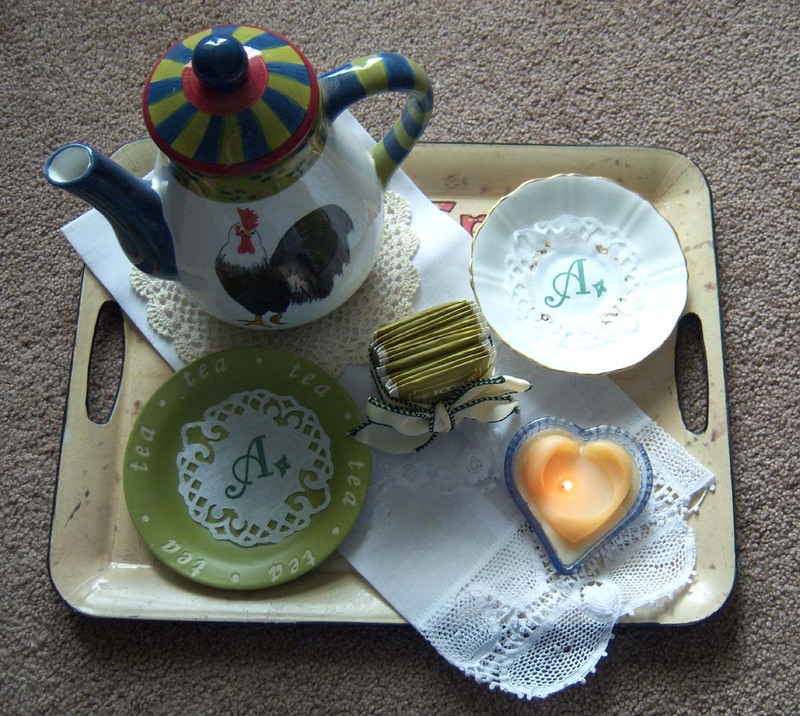 When my s-i-l was here a few weeks back she was experimenting with handkerchiefs and came up with those dainty little doilies under the tea cups (on the saucer). She used a Spellbinders Pendant Set (I think) to cut them out and I stamped the monogram on them with an Inkadinkadoo stamp set. I thought they turned out so pretty. 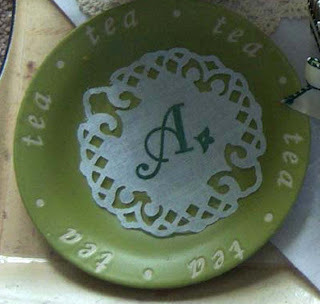 You could monogram a little "doily" for your guest - to use under their cup and then take home with them when they left! My friend got a stack of these little cream colored squares somewhere. 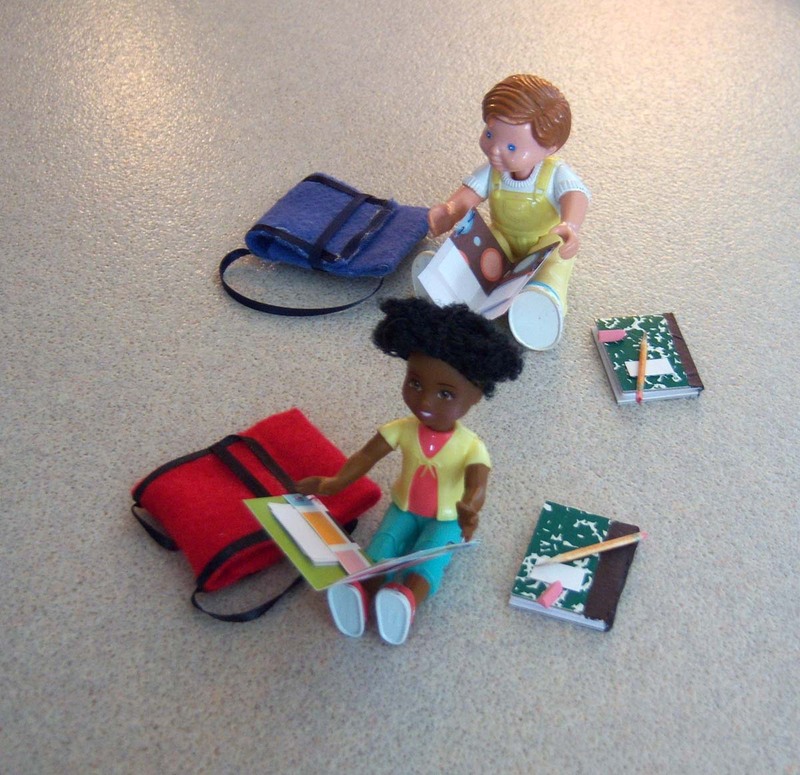 She gave me two to play around with, and this is what I came up with. 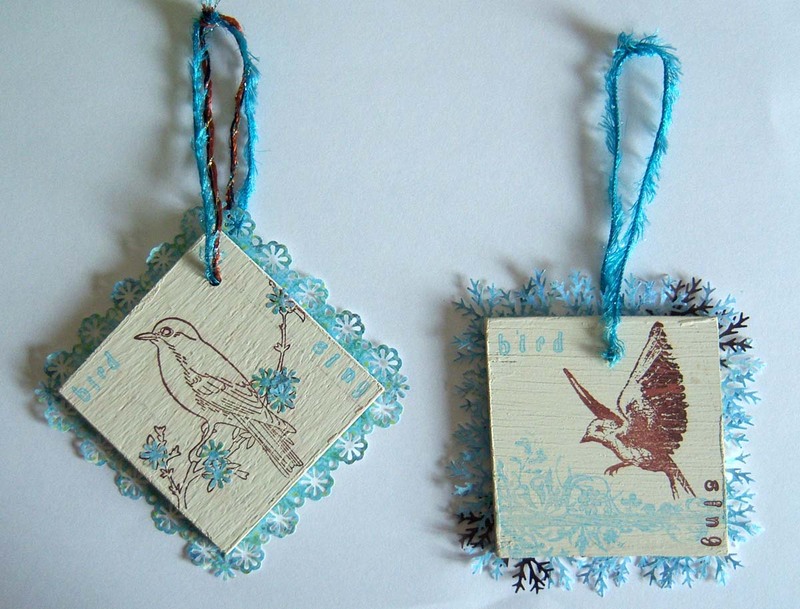 Two hanging bird decorations for my living room. Here's a photo of how I finished off the back so you don't see where I glued the border on. 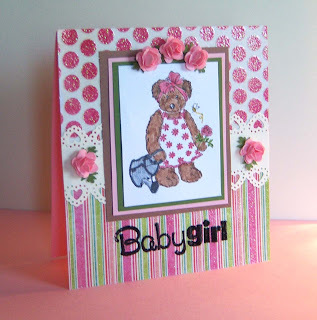 A friend gave my daughter a very nice gift last week...so I wanted to do a little something in return. 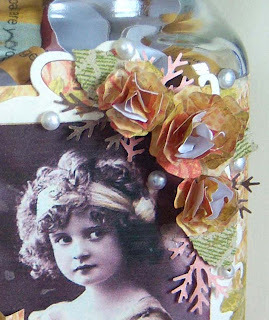 Decided to do her up a journal jar in a Victorian theme. 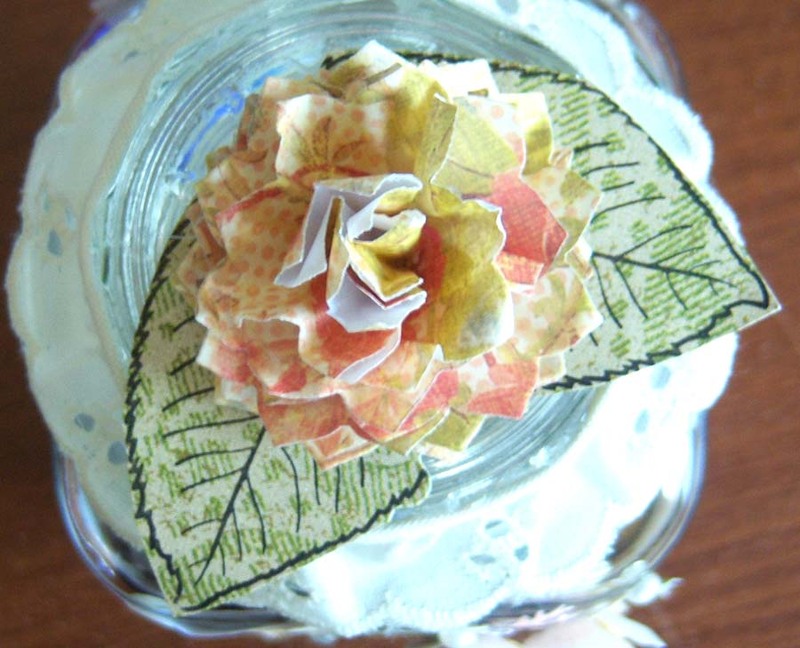 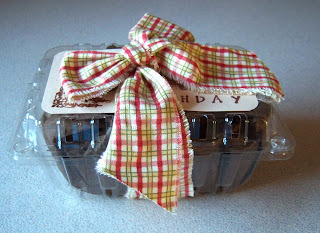 I had found three square jars at the thrift store for 49 cents each ....so I used one of them to make this jar. 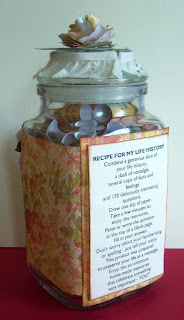 "Recipe For My Life History"
at the top of a blank page. 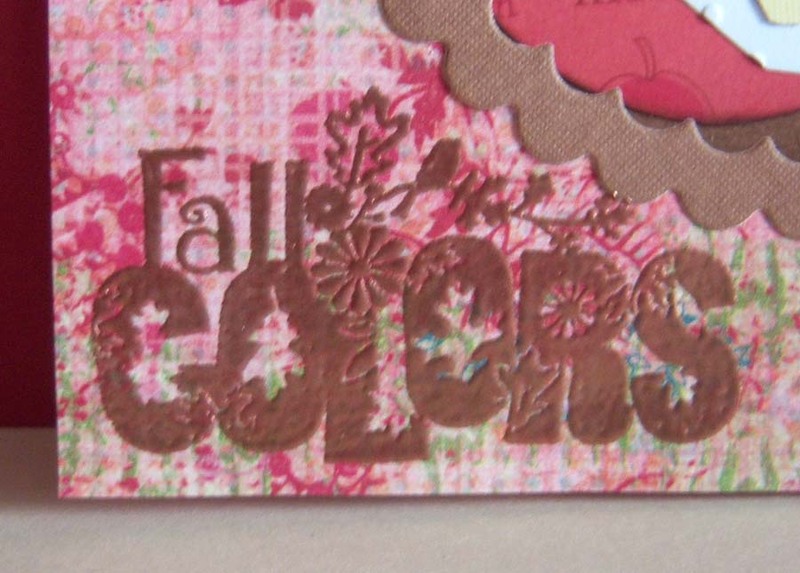 or spelling - just tell your story. to preserve your life as a message. 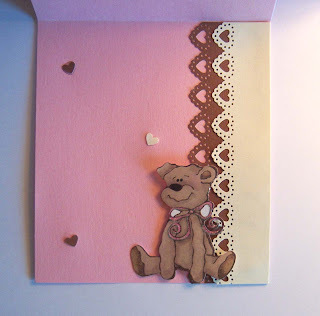 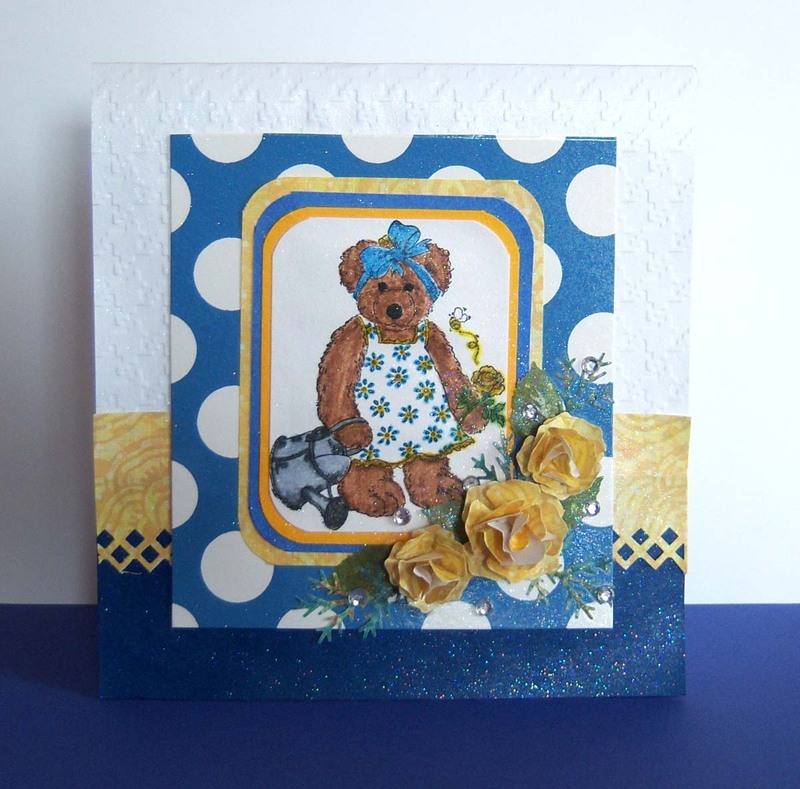 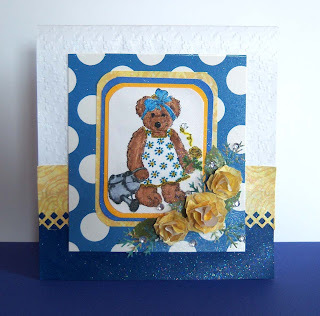 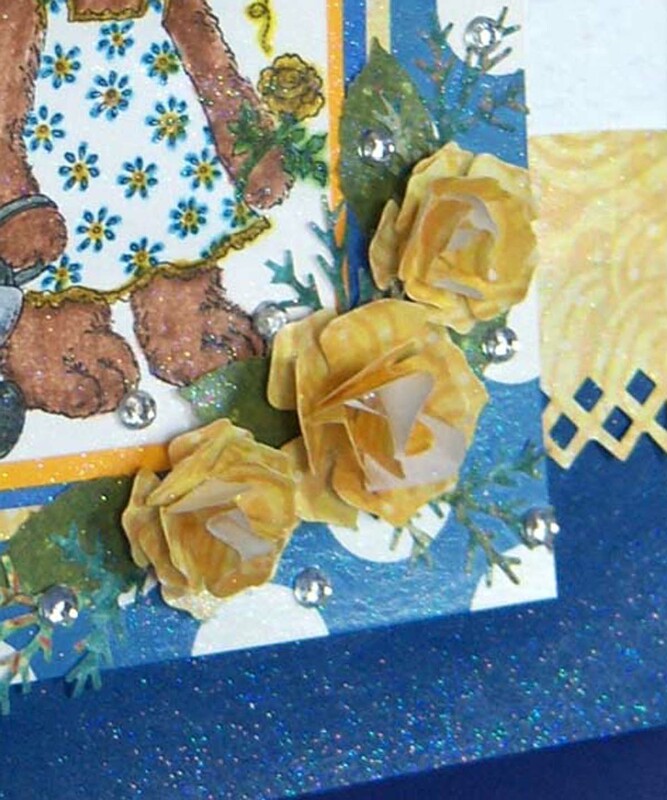 Another card using that cute little bear stamp. 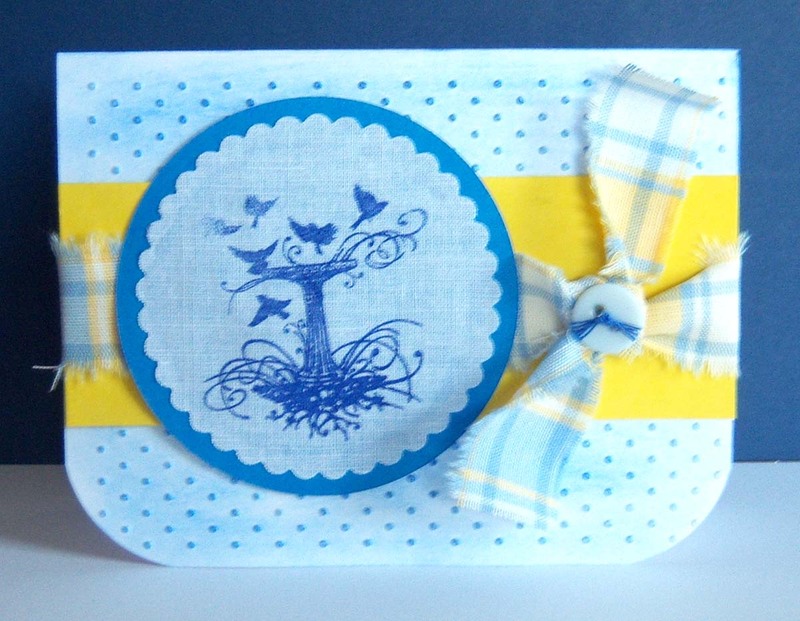 This time a blue and yellow "summery" looking one. 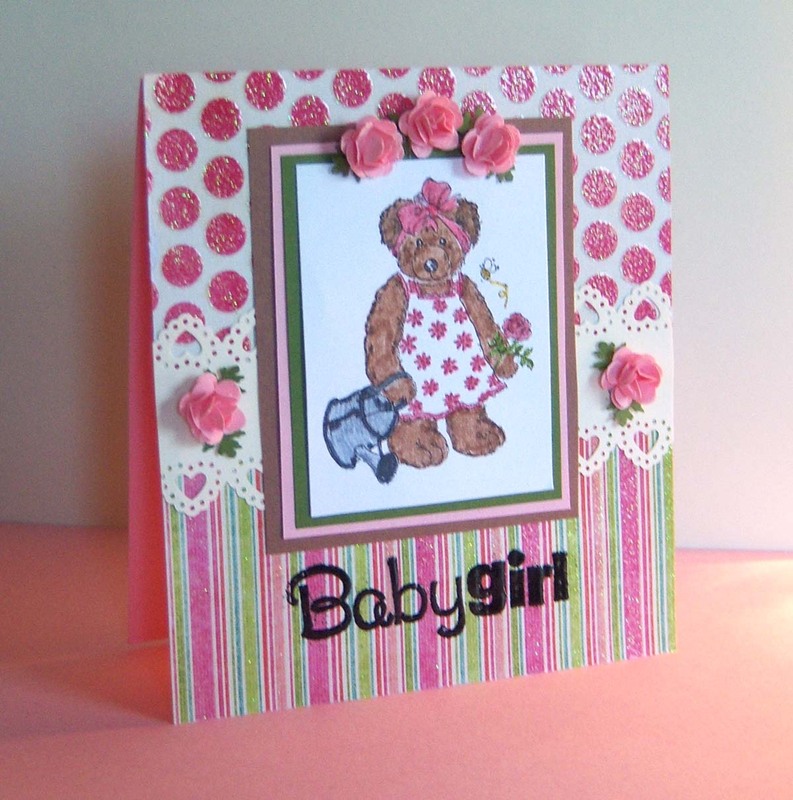 Here's a baby card I did for a friend who just had a baby girl. 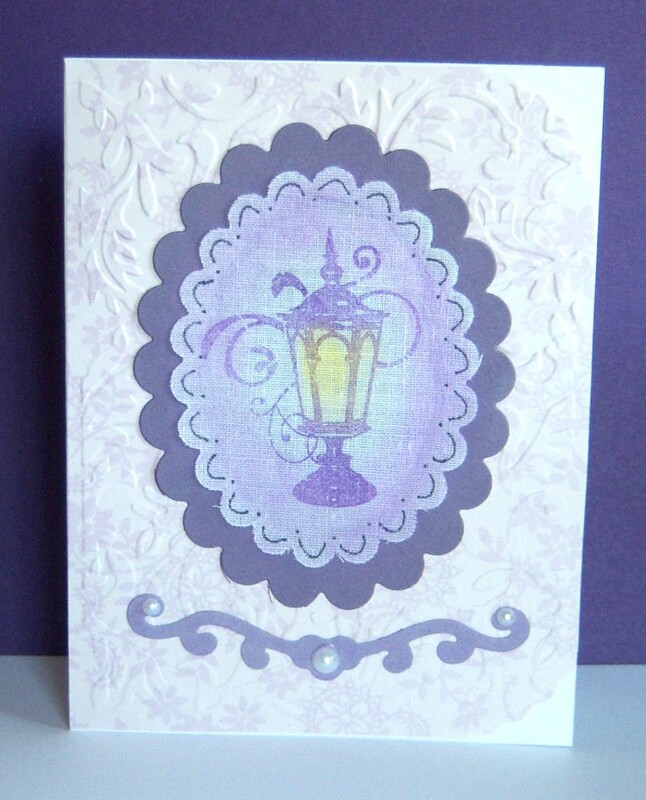 I had a hard time getting a good picture of it as any light wanted to glare off the sparkly paper! 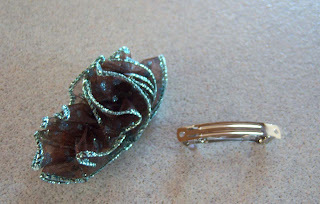 This picture really doesn't do it justice --- it's a lot "softer" in real life....oh well. Another take on that cheap burlap I got at the thrift store two weeks ago. 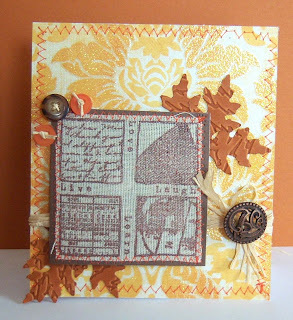 This time I decided to try stamping on it -- as you can see it worked! 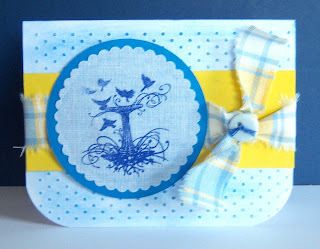 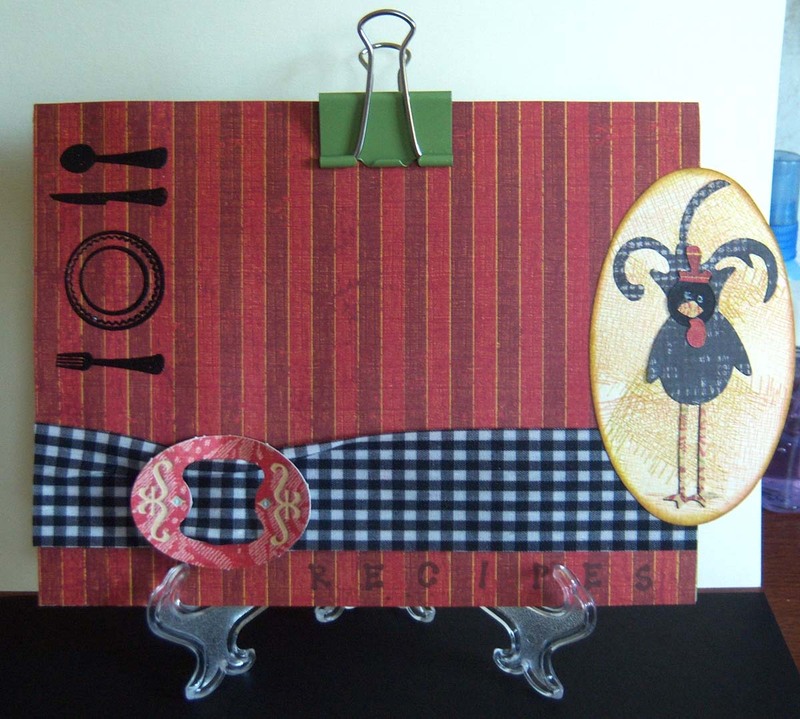 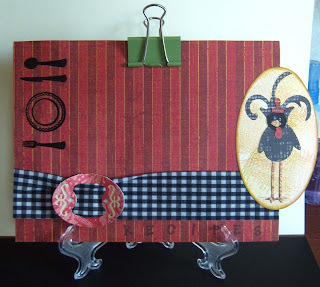 This next one is my favorite --- love the "cool" blue/yellow combination and LOVE what she did with the fabric we purchased.....tore it in strips and used it as ribbon around her card. Wish she could come back again this week-end and scrap with me! 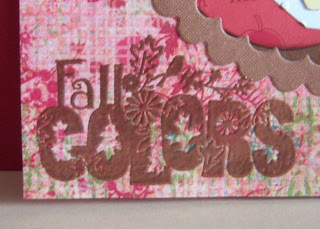 Here's my bulletin board decoration for the month of August.